Hu Ba (Chen Kun) and his fiancee Shirley (Shu Qi) are tomb raiders and they have decided to retire from the trade to start a life in the US. Before the wedding can proceed, Hu Ba sees his first love Si Tian (Yang Ying) standing before his eyes but she has been dead for more than twenty years. Determined to uncover the truth, Hu Ba and Shirley embark on a new adventure. 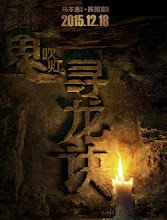 The Ghouls is a 6-series web novel that shot to fame upon its release, inspiring the film adaptation that is helmed by Executive Producer Chen Guo Fu, Director Wu Er Shan and Screenwriter Tianxia Bachang, who is also the original author of the novel. The movie is based on the last four parts of the web novel. Let us know why you like The Ghouls in the comments section. Please also share these fun facts using the social media buttons below.